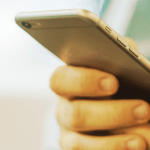 Gone are the days of lead drops and mailers. While these methods have proved successful in the past, they pale in comparison to the influence of internet and social media marketing. Here at Senior Marketing Specialists, we value technology and want our agents to be aware of the marketing potential in websites and networks like Facebook and LinkedIn. We understand there is still some confusion as to why social media marketing is so important. So, we put together this list of reasons you, as an agent, should consider marketing yourself online. If seeing multiple Facebook updates from your elderly family members every day isn’t enough to convince you that seniors are online, check out this infographic! 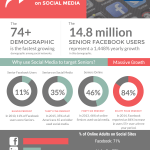 Seniors’ participation on social media has increased drastically in the past few years. It makes sense, really. Without a job to fill their time during the day, who wouldn’t turn to connecting with friends and watching funny cat videos? Additionally, most of your new-to-Medicare clients are coming out of the workforce and are used to computers and the internet. Sure, there are still many seniors who don’t bother with technology much. But are these individuals a lost cause when it comes to social media marketing? Not a chance! They, more than likely, have family members who are well-versed in the internet and may come across your profile while searching for a new agent for their loved one. Communicating through social media is great for adding personal touches to your messages. It’s less formal, and therefore less intimidating, than email and allows you to engage with others in real time. Facebook, for instance, is a fantastic platform for letting your personality show through photos, videos, and updates. Even LinkedIn, a professional site, has features that allow you to customized your brand. As mentioned above, LinkedIn is a platform dedicated to connecting with other professionals. You can share ideas, make updates, and even publish your own articles. Professional networking is especially important for insurance agents. Why? One word: Referrals. Forming a business relationship with other professionals who work with your client demographic can open up a stream of referrals for both parties. If you are a senior insurance agent, consider reaching out to CPA’s, Financial Advisers, Pharmacies, and Physicians. Contact Senior Marketing Specialists to learn the best way to do this! One of the first things you see when you pull up an internet search or a Facebook Business page are reviews. This is where clients can go to express how happy (or disappointed) they are with your service. Reviews are helpful for a few reasons. Firstly, prospective clients can get an idea of what it is like to work with you through the words of others. This is called social proof. Good reviews validate your personal marketing efforts. Secondly, reviews serve as a fantastic motivator. If you go into every appointment knowing your client has the power to say whatever they want in a review, you will perform at the top of your game. And if you happen to get a not-so-great review, you know what to work on. Google uses location to pull up the closest and most relevant businesses. If you have an online presence, you are more likely to come up in someones internet search for an insurance agent. The more active you are online and the more traffic you get to your pages, the better you will stack up in an internet search. This is key to getting your name out there, especially for new-to-the market agents. The human brain processes visuals much faster than text. Like, 60,000 times faster (3M Corporation, 2001). We also retain more information from images and videos than we do from reading alone. So, it only makes sense to market yourself online, where pictures and videos are easily paired with text. This is a much quicker and cheaper way to promote your business as opposed to mail drops or newspaper ads, which are costly and becoming obsolete. A regular Facebook post is completely free, but it only reaches so many people. If you wish for a greater number of people to see your post or an ad , Facebook allows you to do this for a small fee. You can customize the demographic settings to those you wish to see your material. While this costs money, it’s significantly cheaper than the mailers and newspaper ads mentioned above. When you create a Facebook Business page, you have a customizable action button. The button is located at the top of the page and has many actions to choose from. For example, you can make the button say, “Call Now,” “Contact Us,” “Sign Up,” and a myriad of other things. Having a call to action is incredibly important as it prompts potential clients to actually get in touch with you! Have a website you love? Read an amazing article? Facebook and LinkedIn are perfect platforms for sharing this information. Share resources that are applicable to your clients, like senior wellness pages, on Facebook. Use LinkedIn to share whitepapers and articles with those in your industry. While it may not seem like you are marketing yourself, this indirect approach makes others appreciate you for sharing relevant information with them. Not only are you able to share important industry news, but you are also able to consume it through social media. 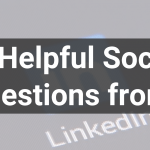 Liking and following reputable outlets on Facebook and LinkedIn are a great way for you to stay on top of important happenings. This allows you to be more informed and, of course, turn around and share this news with colleagues and clients. While there are plenty more reasons social media marketing is über important, these 10 display the breadth and depth of the internet’s reach. Social media marketing doesn’t come as naturally to some as it does others, but that doesn’t mean you can’t learn! Here at Senior Marketing Specialists, we have multiple resources to help you get started or take your social media marketing efforts to the next level. Reach out to us for this complimentary service! We’d love to help. For questions, more social media information, contracting, and more, contacts us!